If the site you seek to gamify is a customer-facing online community, then odds are the community expert framework will meet your gamification needs. It enables you to establish user reputation hierarchies by highlighting reputable contributors. Community expert frameworks not only encourage quality contributions, it also helps with content filtering, not to mention enabling site visitors to make user-to-user connections. Recognition of who the user is, what expertise the user carries, and what social standing the user has is important to creating a natural hierarchy within the gamified community. The distinguishing character or personality of an individual is showcased, leading to desirable engagement and increased community participation. Simply put, the community expert framework is for strengthening and growing diverse communities from fan clubs to Q&A communities in gamified sites. Participants voluntarily pursue expertise in specific topics, unlocking status, prominence, and privilege along the way. Advocates are made of your top users, and the community as a whole benefits from the creation of their celebrity and obsessive engagement. Status and the rewards or privileges that come with it are valuable to the user because of the sense of worth and pride that comes with an increased standing in a community of peers. When your active community members and top content creators are rewarded with status, their output increases — which helps to improve the overall quality of your gamified site. Identity: Recognizing who users are, what their expertise is, and their social standing creates a hierarchy in the gamified community. Individuals are showcased in the community expert framework, which increases engagement and participation. 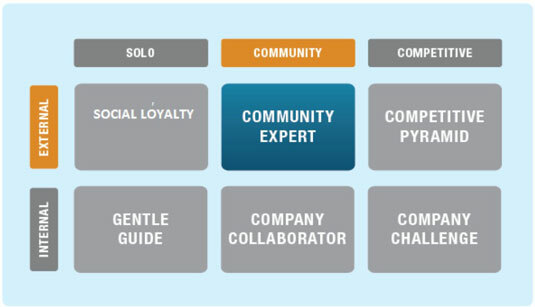 Relevance: Rather than look through pages and pages of content to zero in on answers, the community expert framework showcases users’ own gameplay expertise. Whatever it is that satisfies a user’s needs is easier to find using this framework. Status: An individual’s relative position when compared to others is key. The rewards and privileges of status enhance an individual’s pride in a community of their peers.